To test for real honey, many ways and means have been suggested, such as the ant test, dog test, honeycomb pattern test, lighter test, etc. Most came across as rather bizarre but one "the bubbling test" that has been suggested by many honey aficionados and beekeepers particularly gets much attention because it seems to have some scientific explanation for what is observed. So let us see how convincing the results are. 1)	Pour about 3 tablespoons of honey into a small glass bottle. 2)	Add about 200ml a small cup of water into the bottle. 3)	Shake vigorously for about 30 seconds. 4)	A layer of frothy bubbles will appear on top of the honey. 5)	The foam formed by real honey stays for hours, whereas if it is fake honey, the bubbles produced disappear quickly. So, how does this fare as a real honey test? The effect of bubbling and foaming may be a sign that real honey is present and more bubbling may mean more amino acids present, but it is still not a foolproof test for 100% pure honey. We still have no idea how much of real honey is in there using this test. And we are unable to ascertain from this test whether the honey has been adulterated with corn syrup, starch, or other additives. 1) Real honey contains pollen which the bees carry on the body during the foraging of flowers and collection of honey. These pollens inevitably end up in the bees' honey. Thus, when water is mixed with real honey, it is somewhat cloudy and not entirely clear. When honey sellers boast of their totally crystal clear honey water, you should be suspicious of their honey authenticity. More in: Puzzling Wild Honey Questions. Need Your Help! 2) Most flower nectars do not yield the same flavor as the fruit of the plant. (Even if there may be similar notes, the tastes are usually not intense.) Hence, be wary of fake honey if your honey, such as blueberry honey, lychee honey, raspberry honey, pineapple honey, durian honey, and blackberry honey, bears a strong aroma of its fruit and yet there is no mention of any additives on their labels. Many honeys are infused and laced with chemicals, flavor enhancements and artificial fruit essences. 1) Assess how reliable these various honey authenticity tests suggested by people from all over the world: How to Test for Pure Honey. 2) Are you eating real honey? Consider how helpful these honey labels and claims are: Eating Real Honey? 3) How do you know that your honey is real? Buy Real Honey. 4) Impressed by what is promised on honey bottles? Find out how much is truth and how much is pure marketing tactics: Did You Know Reading Food Label Can Be So Tricky? 5) What is good quality honey? Read: What's Considered Good Quality Honey. 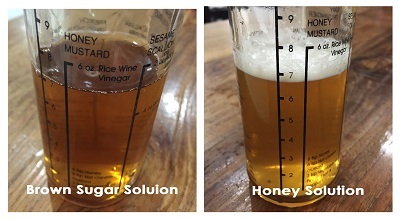 End of "Test for Real Honey - Bubbling Test". Back to "How to Test for Pure Honey"